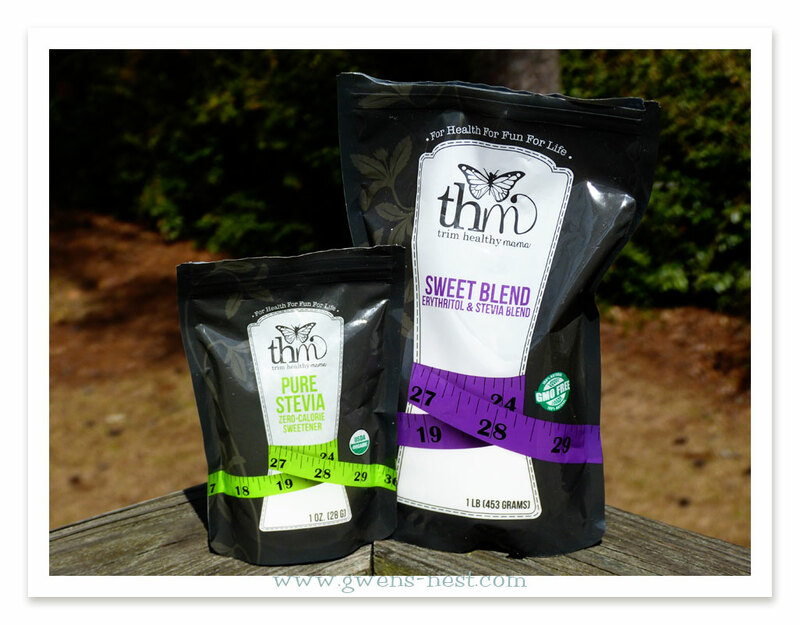 The Trim Healthy Mama Stevia & sweeteners were released today in their online store, (Amazon affiliate link) and there have been SO many questions about them that I thought I’d put together a review. I was given a one ounce bag of their organic Pure Stevia Extract, and a one pound bag of their Sweet Blend for my birthday this year, and have really enjoyed playing with them in my kitchen. I started out using the NuNaturals stevia extract that was recommended in the book. It was good stuff! I did have an adjustment period with learning to use the super concentrated sweetener…I found that stevia doesn’t cover the bitter notes in cocoa well, and it was challenging to learn how to enjoy it in some foods. But after my adjustment period, I really enjoyed the flavor of the NuNaturals…and then they changed the formula. I’m STILL sad about that. But not TOO sad now, because I’ve FOUND my replacement! What brands have I tried? I’ve tried the NuNaturals old formula, the organic NOW better stevia extract, Skinny Girl liquid stevia, the packets from Aldi’s…I’ve also sampled my Mom’s Kal stevia, and for the sake of comparison, some little tablets that she forced me to try years ago that tasted like poison. P.S. Kal has recently started adding corn-based maltodextrin, which is pretty high glycemic to their stevia extract, so that is not happy news. The good stevias are dropping like flies, people! So all that to say, I’ve tried a wide variety of stevia over the course of the past year. The thing with stevia is this: MOST of what is on the market is not that great. The best I can say is ‘pretty good’ or ‘marginal’, but most is in the grody range. And some of it does taste like poison. For real. So if you’ve had BAD stevia, I can commiserate. I’ve also had good stevia, like the original NuNaturals extract. It had a very clean taste. What makes it good, you may ask? Well, the short answer is “processing” and leaf quality. The companies who really care, care enough to process it gently and yet remove nearly all of the components that cause that bitter-aspartame-poison type flavor that can happen. The yummy clean sweet taste of a good stevia is the component called Reb-A. But don’t overlook the actual quality of the stevia plant…the taste profile can really vary a lot from one plant to the next. Between finding great quality plants, AND great quality processing, finding a truly good stevia product is like finding a needle in a haystack. NuNaturals has a RebA 99 product that is VERY pure, but the taste profile is still ‘off”. Drat. The leaf quality really matters with stevia. And an ounce of that stuff is like $15 before shipping! The point is, even when it’s SUPER pure, it’s NOT EASY to find a good tasting stevia! 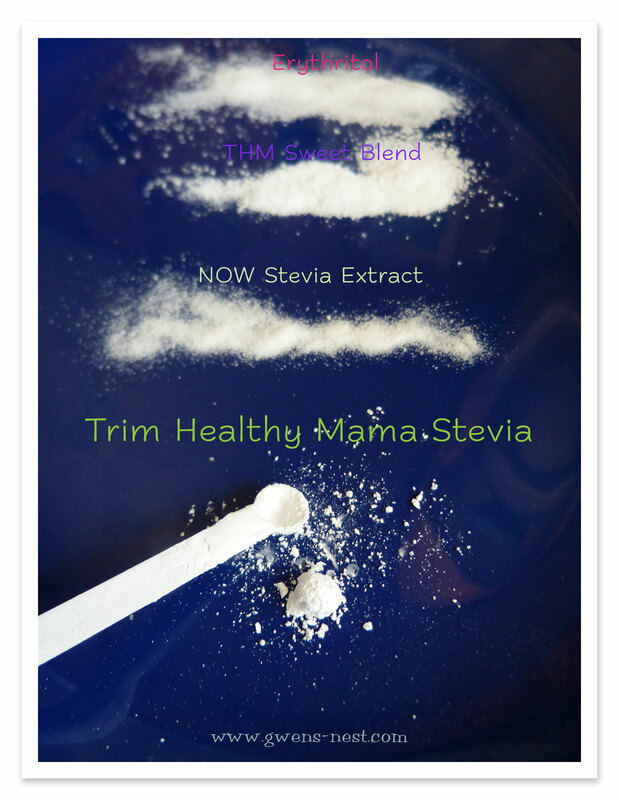 What about the Trim Healthy Mama stevia? I’m picky with taste, and I live with people pickier than I am. So you can trust me when I say it tastes REALLY good. It’s not a weak or pointy sweetness with off after-flavors, and definitely no poison taste. It’s GOOD! I’m SO, so, so excited! 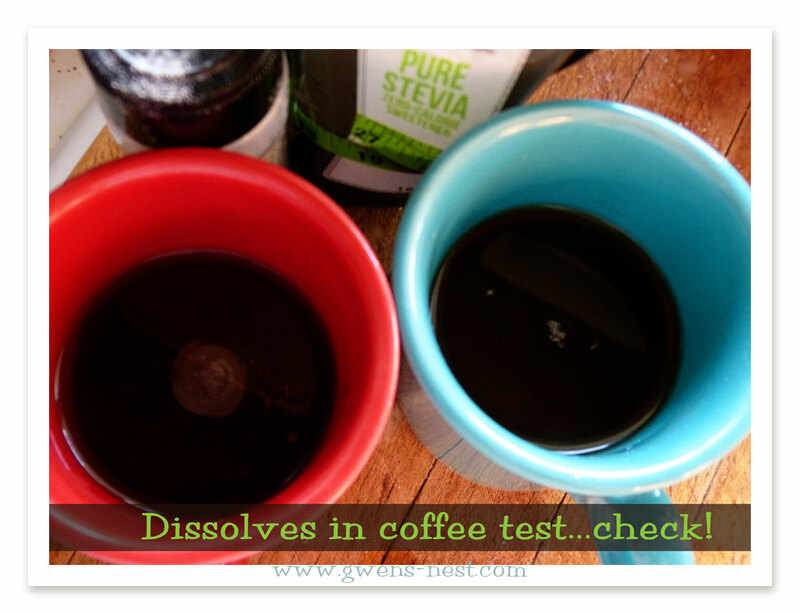 NOW stevia on the left vs. THM Pure Stevia on the right…both dissolve beautifully. This is a big deal for a lot of us who value high quality foods and pure processing methods. Serene is a super-purist, and the processing meets her standards. It’s a water extraction process that uses no harsh chemicals to go from leaf to pure white Reb A powder. The Whole Food blogosphere has come down hard on stevia products, and chemical processing and nasty fillers are THE number one concern voiced against using stevia. The THM Pure Stevia passes both of these concerns with flying colors. I can love it guilt free and with no fear. Since THM Pure Stevia IS the highest percentage of RebA that you can get…higher most all other stevia extract products on the market, it just takes a very small amount to achieve sweetness. What this means to me is that a high quality stevia is a VERY wallet savvy investment. When you look at how NuNaturals has priced their high-end (but not so yummy) Reb99, it’s on ‘sale’ at $14.99 an ounce). The THM Pure Stevia is priced very competitively at only $9.99 an ounce at the time of this post (expect the market to change and flex). So even from a cost comparison basis, it’s a much better value. Sure it’s a small amount, but it will last me a couple of months as I use so very little at a time. How little, you may ask? It’s a good bit sweeter than the ‘fluffier’ stevia extracts out there. One teensy “doonk” of THM Pure Stevia is enough to sweeten a cup of yogurt or a cup of coffee (and I like my coffee sweet!) A doonk is 1/32 of a teaspoon, and is about as sweet as 2 1/2 to 3 tsp of sugar, IMO. 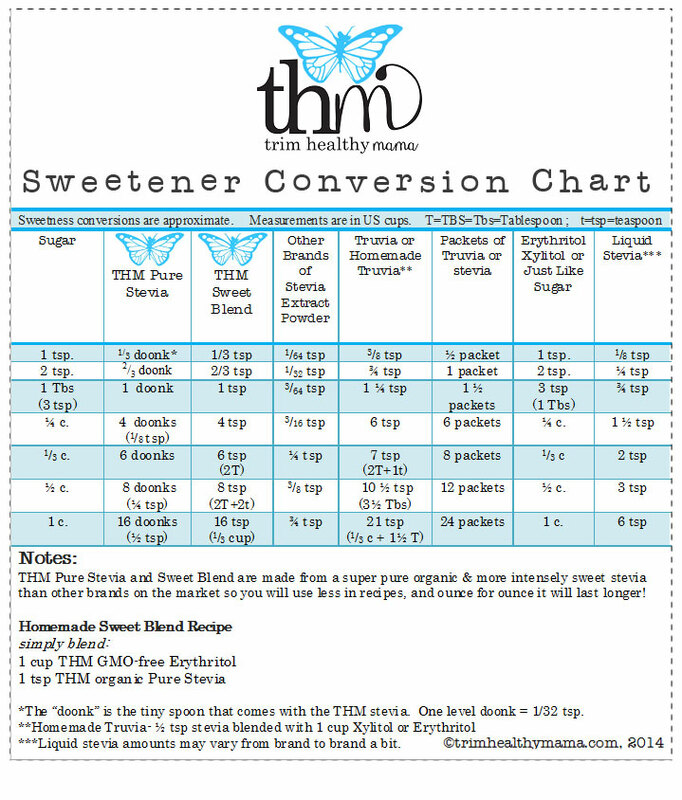 Below is a printable THM Sweetener Conversion Chart, shared with permission from the Mamas…thank you Pearl & Serene! click image to open printable .pdf, then hit your back button to return to this page. You can see just how little stevia you need…only 1/2 tsp is needed to achieve the sweetness in a whole cup of sugar! And that’s what makes stevia not only economical but also far healthier than that cup of sugar on blood sugar levels. 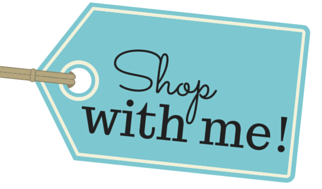 Stay tuned in, as I am working on my top 10 tips on getting used to using stevia for those of you who are new to it! If you’ve tried the new THM Pure Stevia, what do you think of it? I am wondering if you can estimate how many teaspoons would be in the one oz package? One tsp = 2 grams. There are 28.3495 grams in an ounce. So approximately 14 tsp. of stevia in the 1 oz. package by my estimation. And since I’m doing math: 1 gram or 1/2 tsp = the sweetness in a whole cup of sugar. So the little one ounce bag is equivalent to 28 cups of sugar! My husband and I taste tested the Pure Stevia against the KAL (the old KAL) and oh my goodness – the difference was jaw dropping! The THM brand tastes NICE, as compared to all the other stevias that taste decidedly chemical. I made a batch of THM brownies with their Sweet Blend, and it was by far the best batch I’ve made… from a recipe that I’ve used many times these past few months. I am so thrilled to have a GREAT sweetener to use and very happy for Pearl and Serene! Check out Lisa’s question below…Shannon & I weigh in on which we like. I use the stevia & sweet blend for different things. HI, my name is Lisa and I am a beginner! haha I am still trying to digest (no pun intended…OK, maybe a little pun) all that is Trim Healthy Mama. Do I use the “blend” in baking and the “pure” in my tea and yogurt and such? Is it necessary to buy both? Lisa, the blend is good for baking b/c it gives bulk; the pure stevia can be used in any other recipes that don’t require the bulk. So, yes, perfect for teas, non-baked goods, etc. Ditto what Shannon said. The straight stevia is going to last you the longest, so it’s the best value, but the Sweet Blend is nicer with baking & chocolate goodies. I love having both on hand. 🙂 I use the stevia for tea, yogurt, smoothies, etc. and the baking blend for my Muffin in a Mug, Skinny Chocolate (grind it to a powder), etc. The blend is equivalent to Truvia, correct? (New to THM!) Truvia upsets my EBF son’s stomach, so does this mean I’ll be spending a lot on the pure Stevia?! Hopefully they will have enough support to possibly get some overseas distributers :-). Thank you so much for sharing the conversion chart and the great review! then the asterik section says 1/2 tsp to 1 cup erythritol? That is not an error…the sweet blend does use a higher concentration of stevia to erythritol than traditional ‘truia’ type blends. That allows you to use less, and makes it last a lot longer. Plus, with other brands, too much of the stevia component can give things that bitter aftertaste. But that’s not an issue with the THM stevia in my experience. Thanks for the review and conversion chart. I’m anxiously awaiting my shipment. I am new to this and just spent a fortune on other sweeteners but so far we’ve been pretty disappointed. I want my family to be on board with this so I’m really hoping we will love this brand! BTW, I made my kids your mint shake yesterday and it was a huge hit! Awesome! I hope everyone loves the new sweetener! I have also had a hard time finding stevia brands that I love. Thanks so much for the conversion chart, Gwen! My stevia and sweet blend are scheduled to come in the mail today, and I can’t wait to try them. Thanks for sharing this Gwen….you are one of the THMers most trusted resources, so your opinion means a lot to me! I wonder what you thought about the Sweet Blend? That’s the one that would be for baking right? Thanks again! Yes, sweet blend is what I’d use for baking or for recipes with cocoa. I’m loving it! I used 1 jar of Truvia when I first started out, while waiting for my jar of NuNaturals (way back when it was good). I really had trouble enjoying the Truvia…not sure why. Later, I found that a homemade blend was really tastier to me, and I would use that when baking. The Sweet Blend is VERY good. I think the stevia quality has a lot to do with that. 🙂 I also love that the erythritol is GMO free. So is the blend essentially like Truvia? I don’t want to use Truvia because of all the bad reviews. Would this blend be the same ingredients as Truvia? Thanks for all your help! Yes! The Sweet Blend is similar to Truvia, but it’s made with organic stevia, and non-GMO erythritol. Sweet blend is a lot sweeter than Truvia, tsp to tsp, so you’ll get a lot more sweetness for your money with the SB. I’m glad you posted this….it’s hard when all the companies claim theirs “tastes great”….I can’t tell you how many times I’ve thrown out stevia because it was just disgusting. I have some of the Now Better Stevia liquid glycerite right now (which has been the most tolerable and fairly good) that I need to use up, but when it’s done I may try the THM brand. Okay, I just checked my KAL bottle and it does have maltodextrin in it. So, no stevia until I can get an order delivered? KAL has been the only type I have liked since NuNaturals. Frustration 🙂 Thank you for keeping us posted. Where does this type of information come out first? THM Facebook is so overwhelming, I just don’t go there. Erin, THM is working on a much better solution for getting info out there. You’re right: the facebook groups are overwhelming and hard to find the right info. I would be comfortable using up what you’ve got, but it would not be my long term choice for a stevia. Maltodextrin is just one a product that I’m impressed with. I use the NOW brand, which is less expensive. You mention it, but do not compare the two products directly. Any thoughts? It looks like ounce for ounce, the NOW brand is cheaper, but the sweetness & quality are not as high. The THM stevia is a 99% Rebiana product, and the NOW stevia is not…it’s less expensive because it’s a cheaper grade of stevia. According to the NOW stevia website FAQ, it’s “no less than 80% glycosteviosides” for their stevia, that that would include any or all of the 4 sweet steviosides found in the stevia plant. The THM stevia is 99% pure reb A, which is the best tasting/sweetest of the steviosides. Now is what I was using prior to the THM stevia, and the taste is just OK…not nearly as good as the THM Pure Stevia in my opinion. According to the NOW stevia conversion chart, 2 tsp = 1 cup of sugar, compared to the 1/2 tsp of the THM stevia. Kal is on the sweeter end of the spectrum with other stevia brands, so it may be very similar with amounts used. The NuNaturals & Now you have to use more. We’ve heard great feedback from ladies who are used to using the Kal stevia! Any chance you can increase the font size so my sorry eyes can read a printed copy better? The denominators are difficult to make out. Pretty please with a cherry on top :). Thank you in advance! Oh I SO agree with you, Heather! I switched from the old NuNaturals (they reformulated to qualify as a food additive instead of a ‘supplement’ with the new FDA rulings on stevia). Then I went to the NOW better stevia. I am in LOVE with this one…maybe even better than the old NN! Thanks Gwen! I appreciate you sharing that comparison and I didn’t know that about the NN formula, so thank you! :) I emailed Pearl and Serene to see if they would let me review it for my blog! :) Fingers crossed!!! :) Thanks again!!! Gwen, would you consider adding the suggested uses for the new products? I’m a visual learner and I LOVE charts! Thanks for posting this! I got my sweetners on Friday and was too tired to search through the FB chat for a chart like this. I have used it for oatmeal 1tsp sweet blend for a whole cup of oatmeal. Was slightly sweet and absolutely perfect. Then I used the stevia for sweet tea, but don’t think I used enough (being stationed in the south for the last 9 years has given me a real sweet tooth when it comes to tea). I think I will go back and add 4 more donks Does the stevia mix better in hot or cold beverages? I kept feeling like there were clumps at the top that I had to mash on the side to get to mix. Thank you so much for sharing, Gwen! Do you think the Pure Stevia might actually work with cocoa? Shipment to The Netherlands will be more than the actual cost of the product, so I really want to know it’s worth it. And shipment for the sweet blend would actually be more. It’s not easy to find Erythritol here. I have NOW Better Stevia powder and think it’s doable in tea, coffee, yoghurt or goodies with fruit or lemon juice in them, but I sooo miss good chocolatey things! I’m curious if there are others out there who don’t like to use the Erythritol? I’m not happy using it. but what do you do for those recipes that need the bulk? Suggestions would be great. I live the pure Stevia for almost everything but as mentioned the brownies and a few other recipes I have it just don’t turn out. I need suggestion on how to do that?! I just opened my THM stevia today and it is awesome. Straight out of the bag good!! Amazing. However, has anyone found a container to store theirs in? Already the Ziploc top doesn’t shut and a Ziploc re-zippable and collapsible bag it comes in is an accident waiting to happen in this house 🙂 We’re accident prone, I guess. I use a mason jar….a small jam one. It works great! 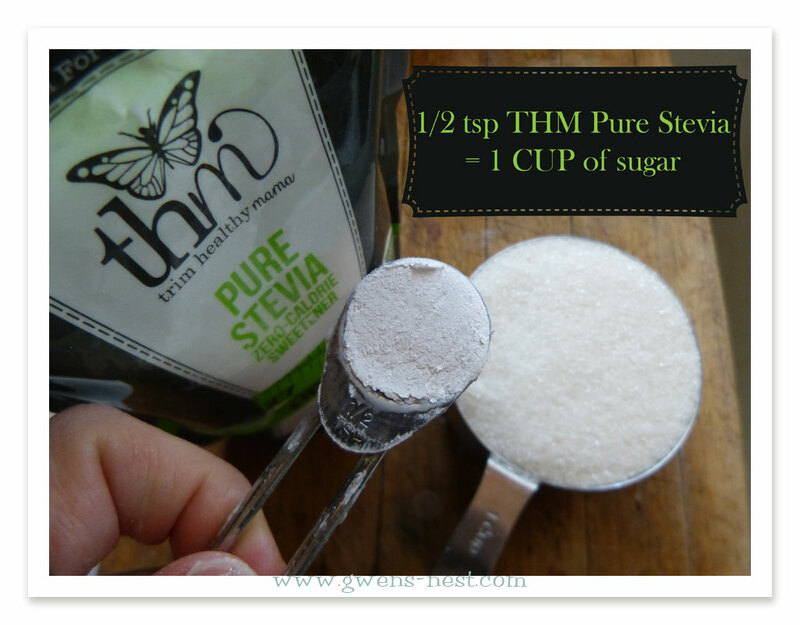 Do I still only use 1/2 tsp of the THM pure stevia extract to erythritol to make the home made truvia or do I use less because it is sweeter? I’d use somewhere between 1/4 and 1/2 tsp depending on how sweet you want it. It’s not really an exact science, and you’d just adjust the end amount to the sweetness you like. I’d guess 1/4 tsp per cup would be the closest to the sweetness of store bought blends and could be used in the same amounts? I’m missing something here when it comes to the proportions. 4 doonks of pure stevia = 6 tsp Truvia, but 8 doonks = 10 1/2 tsp. and 16 doonks = 21 tsp. Why does the proportion change? It’s very difficult to offer conversions with stevia, since it’s SO concentrated and the ‘doonk’ is so tiny, so the proportions are not going to be exact. The chart offers a pretty good estimate, but it’s best to always go with the ‘by taste’ method for what sweetness level you desire. I vaguely remember that someone reviewed the THM stevia and recommended how to store it. I’m finding that it doesn’t do well in a shaker bottle because of how fine the consistency is. Do you have any recommendations? Sorry. Just saw the review by Joy in Our Journey. That’s where I saw it. Thank you for your wonderful blog. I’m brand-new to THM and am on day 4 of the plan and loving a lot of the recipes thus far, but wasn’t sure if I should order the stevia or not because of bad tasting stevia I had tried in the past. I’m so thankful for this review. I ordered some from THM tonight! I saw your post about your goal weight and it was so inspiring to me. I am at the same start weight as you, with the exact same body type, and I have the exact same goal weight in mind that you reached! I, too, have bigger bones and though people don’t think I weigh what I do, it’s all in the muscly, big thighs and behind. I’ve been having lower back strain, which I think is due to having a big behind, so that is one reason I’m eager to lose a bunch of weight. Your comment about hiding your behind in the tree just totally tickled my funny bone! Your blog is the best I’ve seen so far related to THM. I have your Easy Bread fermenting in my fridge, awaiting pizza night and I’m sharing your recipes with all of my friends. Just had to say thank you for taking the time to share your life here! Do you know if there is ANYWHERE in the UK I could get the stevia stuff from? Its 40 odd pounds getting it here! X 🙂 love ur blog by the way! Anyone have any tips for resourcing a good stevia in the UK? I don’t think the THM brand is international yet, so the shipping is fierce. 🙂 Look for a THM Facebook group for Europe and ask there? I was wondering, have you heard of/tried Sweet Leaf Stevia? I think it’s pretty pure, and I was wondering how it compared to THM stevia. I have used the drops, and I really like the hazelnut and vanilla flavors. I’ve not tried their extract though. I had a couple of people try it as well and they had the same reaction.. Wish I could say differently… But I am afraid to try it again. I had to throw out the recipe I made bc it was so bad. I’m so sorry you had a bad experience with the Sweet Blend. Did you let the company know? They’re very good about taking care of their customers. Was that your first time using a stevia based sweetener? You’d use about 1/2 to 1/4th of the amount for sugar when using Sweet Blend. With stevia, it does take on a SUPER sweet and very unpleasant taste if you get too much. I really recommend using recipes that call for your specific sweetener, and starting with the lowest amount possible and working your way up to get it to taste. Now, if you get a headache with it, then I’d ditch it and look for another type. I have a printable sweeteners chart in my new Trim Healthy Mama Quick Start Guide, and several other good options in the THM Amazon Store. Can you tell me if they will be updating the sweetener chart to include gentle sweet? I’m not sure. My guess would be yes? I’m just an affiliate blogger, so I don’t really know anything about the plans they have. You should email and ask them though! Xylitol is antibacterial, and can cause digestive upset in some people. And others react to both that and erythritol…and yet others have issues with stevia. My advice would be to buy a very small amount of quality stevia…maybe even a sample size if you can find it, and try it to see how you react. The other sweetener to consider is Monk Fruit extract and inulin. As far as subbing stevia, in many cases, I will call for erythritol or xylitol based sweeteners because they melt and/or add bulk similar to sugar. So it doesn’t always work to swap things out with just stevia, but sometimes it does. Yogurts, teas, etc. are really nice sweetened just with stevia, IMO. I love the article and the very in-depth conversion chart. I’m a very visual learner so to have it spelled out is wonderful. Now that there is the pure stevia, the super sweet, and gentle sweet what is the conversion? I would like to make me own for baking as well as smaller amounts for smoothies or single serves. Being new I am a bit overwhelmed. Thanks Gwen. Off to make your sourdough bread! I do use the THM stevia and I actually use a lesser amount of it than you do Gwen. It is very very sweet so one only needs to use a small amount, many times less than a donk. I have cut the amount of stevia used in my cake in a muffin to 1/2 of the stevia amount called for. Yes, it is the best tasting stevia I have used. Try it, you will be pleased. It’s good stuff! A friend of mine commented on FB that her husband went out of town, and she sent the THM stevia with him. And she was baffled why her coffee wasn’t tasting good. Until he got back with the stevia and it really wasn’t the coffee that was not as good. 🙂 It was the other brand of sweetener. So now she’s going to order a bag to send with him when he travels. Ha! I am allergic to Stevia. Do you have any recommendations for brand of Monk Fruit? That will work with the THM plan I am getting ready to start? I have been using Pyure. A recipe calls for 1/2 cup Gentle Sweet and I don’t know how much Pyure to use. Can you help? Also, what do you think of Pyure? I spent $40 at the health food store on natural liquid Stevia only to find out that if you are allergic to ragweed that it can flare up sinus issues. I was sick the whole week on it with congestion, sneezing etc. while on my daily meds for that. I was miserable. I have not even started the plan because of that. 🙁 I am diabetic and that was like a slap in the face. That stinks! I’m so sorry. Stevia is in the ragweed family, but everyone who is allergic to ragweed is not allergic to stevia. I mention that in the Stevia Safety blog post. Allergies are not uncommon, so I always tell people to try a small amount of something new first to see if it will work for you. I find that Amazon or online shopping options are almost always cheaper than local health food stores. Some people use swerve in their recipes. How would you substitute super sweet blend, truvia or whatever? Great question! Swerve is straight erythritol, right? With Super Sweet Blend, I’d use less than half of the amount of Swerve. Some recipes use the sweetener as a bulking agent, so you’d want to experiment to see what works best. With Truvia, I find it to be less sweet than Super Sweet Blend by a pretty fair margin, and I’d use half of the Truvia for Stevia. Hi, does it have a bitter after taste?. Of all the stevia products I’ve tried, it’s the nicest flavor. I only get hints of bitterness if I use WAY too much, but you’d get that with any stevia, and it would be unpleasantly sweet at that stage anyway. Hi All, I wanted to ask for your advice. I am making a low carb chocolate pudding that calls for 4 tbsp of erythritol, but I want to use the whole foods version of their organic stevia extract liquid. (It’s just stevia rebaudiana leaf in a base of deionized water and 11% organic alcohol. The pudding has unsweetened cocoa powder in it. I was going to try 1/4 tsp to start with and go from there. Do you have a recommendation? Thanks! Hi Jean! I’d start small and work up…maybe use 2-4 drops, and taste and adjust upward. The stevia drops are much more concentrated than erythritol. You can always add more, but you can’t take it back out. I am baking and ran out of Thm gentle sweetener can I but I do have super sweet blend. Can I substitute ? What is the ratio? I am in the middle of baking. There is a substitution chart on their website here. I am wondering how THM pure stevia compares to Now better stevia powder. It’s only $53 for a whole pound. and it seems the ingredients are the same. About 3 years ago I bought a lb of NuNaturals and I am about to run out. So I’m ready to invest in my next lb. I’ve tried some other stevia extracts in my search for a replacement, including the new Nustevia formula, but none of them seem to get even near to the old nunaturals product. I am really excited, becasue all in all, I think THM is probably the only stevia that comes close to what the old nunaturals stevia offered. And frankly, I so am tired of trying and discarding other brands, that I will probably stick to THM from now on. Thanks to Gwen for writing this article! I reviewed stevia safety here. It’s something that’s NOT a good fit for everyone (some people are allergic and shouldn’t use it!) but I enjoy it, and it’s been a great part of my healthy lifestyle. There is not a single bit of evidence that I’ve seen that links it to cancer. It’s been used daily in Japan for over 70 years with no reported ill effects. 🙂 The THM stevia is a purified product from organic plants- they’re simply removing the bitter components to leave just the sweet part. If stevia is *not* a good fit for you, then you can try Monk Fruit extract, xylitol or erythritol, or inulin as other options.